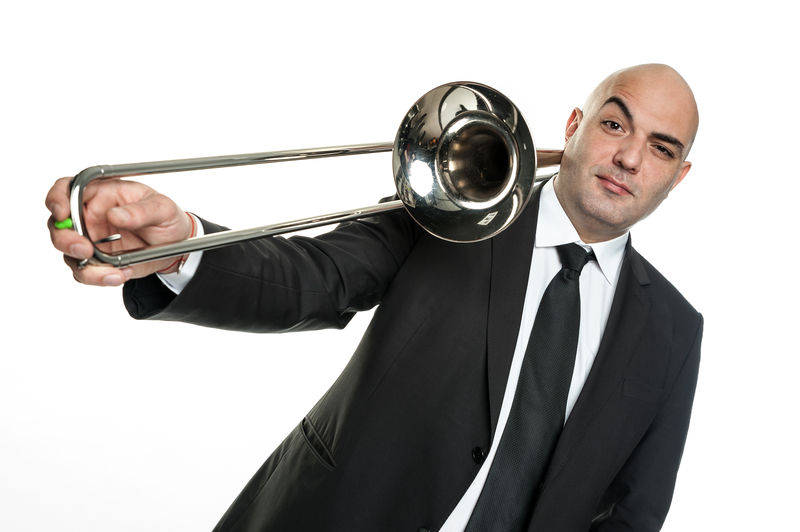 Velislav Stoyanov has played with bands Infinity, Wickeda, Kaffe, and today continues to be part of the musical ensembles Brass Association Combo, Brass Association Big Band, Michael Yosifov sextet, RomaNeno Project, BrazzViliDJ and Tumbaito, created together with Mihail Yosifov. Grandson of the great Bulgarian composer Joseph Tsankov, Velislav is one of the most active musicians for concerts and studio recording. Besides working with the best Bulgarian musicians, Vili had joint appearances with names from the world music scene as Dephazz, Mezzoforte, Dave Weckl, Jimmy Bosch, Herman Olivera, Max Moya, Peter Herbolzheimer, Poogie Bell, Frankie Morales, Charles Mack, Jiggs Wigham. He used to play first trombone 11 years for the orchestra of the National Opera and Ballet. Then he was first trombone for 3 years in Symphonic Orchestra of Bulgarian National Radio. In 2008, along with trumpeter Mihail Yossifov, creates conceptual unification of brass musicians Brass Association, which in last few years actively works for the promotion and revival of brass music in Bulgaria, and is an example and support for many young Bulgarian brass musicians. Velislav Stoyanov is founder and music director of the first festival in Bulgaria dedicated to the beauty and richness of brass music, called Brazzobrazzie, whose first edition was held 10-12 February 2012 and in July 2016 was its 8th edition. He is head of Brass Association’s educational project "Taking Class with Brazz", which main idea is to promote brass music among children, in which musicians from the Brass Association carried out outdoor music lessons to children in primary and basic education course in many metropolitan schools. Couple of years he was teaching chamber music at National Music School "Ljubomir Pipkov." Along with Mihail Yossifov are heads of schools big band. For many years he worked individually with students. From October 2017, Vili Stoyanov is the chief artistic director and conductor of the Youth Brass Orchestra “Dimitar Mechev” at Velingrad Community Center. Since the beginning of the year he became a member of Mr. Brass, the only octet of its kind built up entirely of copper brass instruments, which performs specially written works from contemporary Bulgarian composers such as Rumen Boyadzhiev-son, Vladimir Dzhambazov and Georgi Stresov.